Come have a look at this charming, ready to move in bungalow with plenty of charisma! This one owner home is the perfect family home..... large backyard with south facing 26' three season room, garden area, new concrete driveway, oversized single garage, and yet plenty of room for the kids to play. Great location two doors down from St. Paul's School, close to Columbia School, hospital, parks & amenities. This 1008s.f. 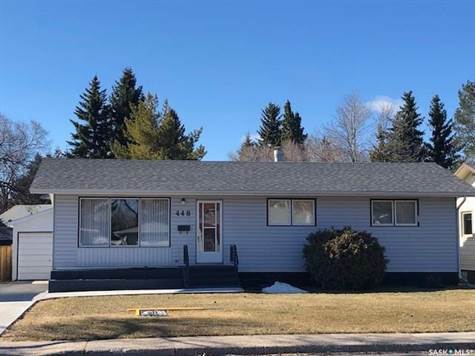 bungalow with 3+2 bedrooms, 2 bathrooms is in move-in condition with many upgrades. The cozy kitchen has upgraded flooring, custom oak cabinetry with an abundance of countertop and storage space. Off the dining room is the large living room boasting lots of natural light. Down the hall you will find three bedrooms and a spacious 4 piece bathroom with jetted tub. Fully developed basement has open games and recreation area. Two bedrooms conveniently located by 3/4 bathroom. Plenty of organized storage as well as large laundry/utility room. Fully landscaped backyard is like your own private park. Slight updates required but price has been adjusted so you can build some equity while adding your personal touch. Improvements & upgrades: Concrete driveway 2017, furnace 2008, water heater 2015, shingles 2018, three season room 2018, oak cabinets & lino in kitchen. Property has never had water!!!! !